According to the latest report of the Renewable Energy Policy Network for the 21st century (REN21), renewable energies are witnessing an important increase. Indeed global generating capacity of grid-connected solar photovoltaic rose by 52 percent and wind power by 28 percent in 2007, compared to 2006. These renewables are due to have a bright future, but this shouldn’t make us forget they represent a mere 0.1 percent of the current global energy mix. The renewable energy industry is stepping up its meteoric rise into the mainstream of the energy sector, according to the REN21 Renewables 2007 Global Status Report. Renewable energy production capacities are growing rapidly as a result of more countries enacting far-reaching policies. 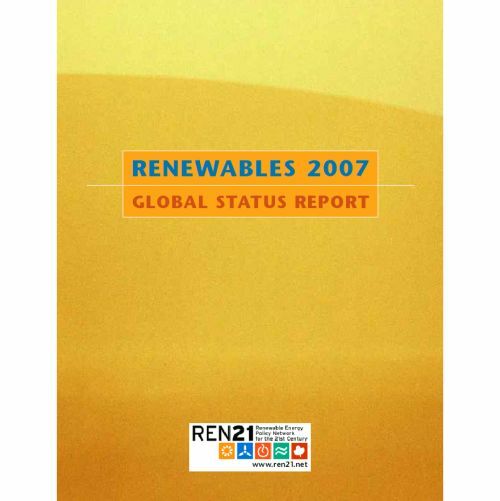 Prepared by the Renewable Energy Network for the 21st Century (REN21) in collaboration with the Worldwatch Institute, the Renewables 2007 Global Status Report paints an encouraging picture of rapidly expanding renewable energy markets, policies, industries, and rural applications around the world. (…) “So much has happened in the renewable energy sector during the past five years that the perceptions of some politicians and energy-sector analysts lag far behind the reality of where the renewables industry is today,” says Mohamed El-Ashry, Chair of REN21. Worldwatch President Chris Flavin says the report shows that renewable energy is poised to make a significant contribution to meeting energy needs and reducing the growth in carbon dioxide emissions in the years immediately ahead. “The science is telling us we need to substantially reduce emissions now, but this will only happen with even stronger policies to accelerate the growth of clean energy,” he says. (…) Commenting on the dramatic rise of renewables, Achim Steiner, UN Under-Secretary General and Executive Director of the UN Environment Programme (UNEP), said: “The findings come in the wake of UNEP’s annual gathering of environment ministers in Monaco last week. But this should make us forget that renewables have, like any other energy solutions, darker sides. I already wrote about that earlier, see for example this article. I will soon write another article on this topic as the French magazine Science & Vie published a very interesting file on it. So, stay tuned and don’t hesitate to comment this article as I would gladly read you.